I hope you were able to snag a few great deals during Black Friday, Small Business Saturday and Cyber Monday! I ended up buying a few more things than I probably should have but I didn't stray from my fall/winter wish list which was an accomplishment. I mentioned before that I've been trying to be more self aware of what I'm buying and I only want to add pieces that I truly love to my wardrobe which means no impulse buys! 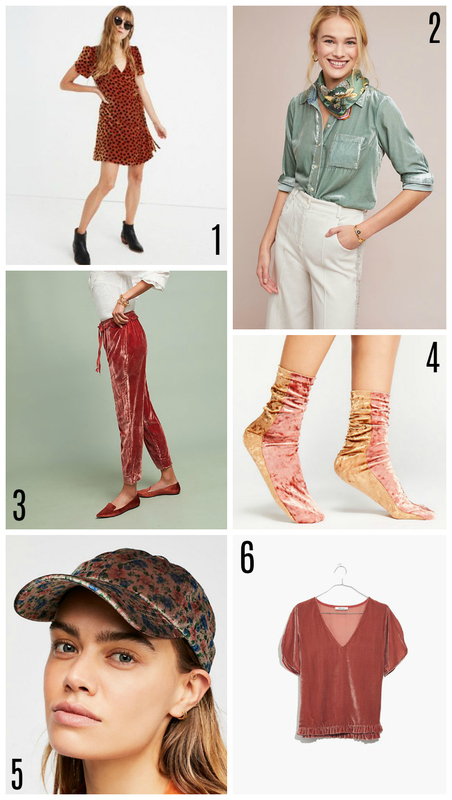 One trend I'm loving this year that I think is going to stick around for quite a while? Velvet! I picked up these velvet booties and these velvet pants during black Friday and I'm so excited to work them into my winter wardrobe. Plus, how fun will they be for the holidays!? I've included a few other fun velvet pieces I'm loving below. I love velvet for the holidays! That green blouse is so pretty! I have such an obsession with all things velvet! These pieces are stunning.